All writings aren't of one type in this book. Some of these periods, some pretty old. These were printed on different papers in different times as Anandabazar-Yugantar, Ajkal-Bartaman patrika. Some delightful composition, some private articles, a travel story, this book is written by some humorous stories. 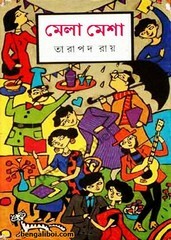 Overall the book has been named Mela Mesha. The ebook pdf has 137 quality pages, 9mb file size and written by the prominent Bengali author Tarapada Roy.